Are you ready for another day of My Creative Time sneak peeks? Today we are showcasing a fun little set called Huge Celebration, which is our freebie this month! This set will be free to the first 100 shoppers this Friday beginning at 8 AM PST. Huge Celebration has just two stamps in it, but they pack a punch. 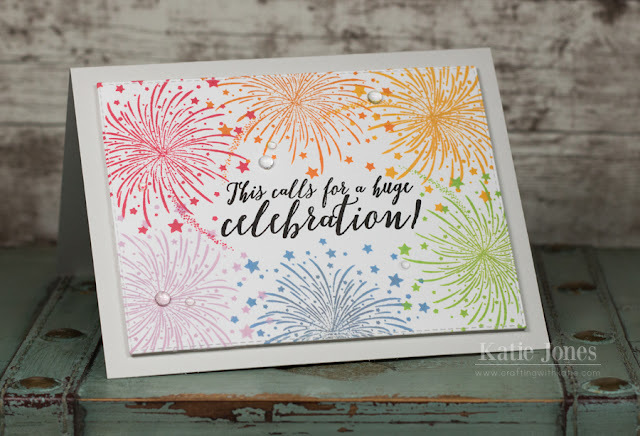 There is the sentiment, which I stamped in black ink on my card, and then the gorgeous firework, which I stamped in a rainbow of colors! I then die cut this piece with one of the MORE Stitched Rectangular Dies and attached it to my card base with a piece of fun foam in between for some extra dimension. A few Papertrey Ink Rainstones finished off this card! OMG Miss Kate....Celebrate Good Times.....C'mon!! WOWIE WOW your Fireworks are Sparkle-Tacular!! Love it and your idea for stamping in all kinds of colors...makes for a Funtabulos Look. You so did a Super Outstanding Creative Job!! Love this set. Love your ideas. Love all the fun colors. This is a cute set. Beautiful work with pretty colors! Oh wow this card is amazing looks like there's a celebration going on! Love your card Katie! Love the beautiful rainbow-like colors of the fireworks! Gorgeous!!! LOVE the colour combo! Love your rainbow of fireworks! So pretty Wonderful job on your card! Love those beautiful fireworks! Pretty card! Great color combo!